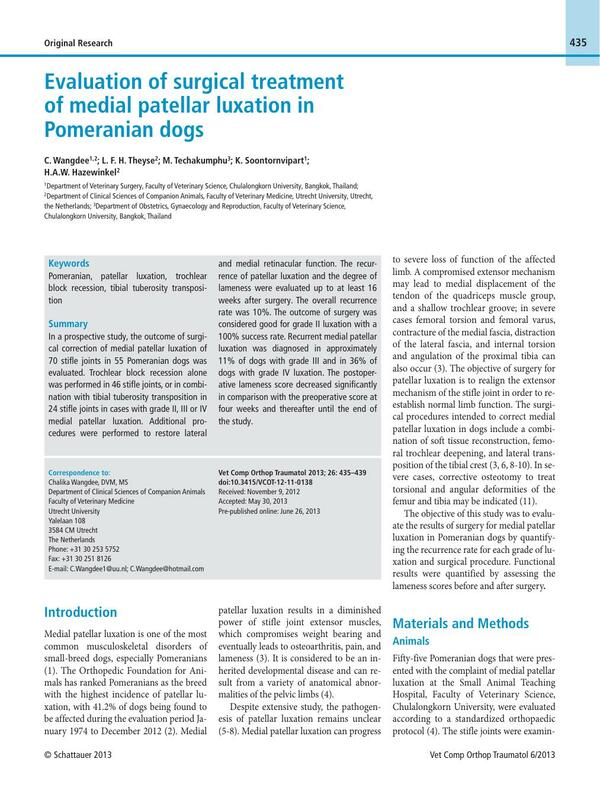 In a prospective study, the outcome of surgical correction of medial patellar luxation of 70 stifle joints in 55 Pomeranian dogs was evaluated. Trochlear block recession alone was performed in 46 stifle joints, or in combination with tibial tuberosity transposition in 24 stifle joints in cases with grade II, III or IV medial patellar luxation. Additional procedures were performed to restore lateral and medial retinacular function. The recurrence of patellar luxation and the degree of lameness were evaluated up to at least 16 weeks after surgery. The overall recurrence rate was 10%. The outcome of surgery was considered good for grade II luxation with a 100% success rate. Recurrent medial patellar luxation was diagnosed in approximately 11% of dogs with grade III and in 36% of dogs with grade IV luxation. The postoperative lameness score decreased significantly in comparison with the preoperative score at four weeks and thereafter until the end of the study. 1 Soontornvipart K, Wangdee C, Kalpravidh M. et al. Incidence and genetic aspects of patellar luxation in Pomeranian dogs in Thailand. Vet J 2013; 196: 122-125. 3 Hulse DA. Pathophysiology and management of medial patellar luxation in the dog. Vet Med Small Anim Clin 1981; 76: 43-51. 4 Piermattei DL, Flo GL, DeCamp CE. The stifle joint. In: Piermattei DL, Flo GL, DeCamp C.E. editors. Handbook of Small Animal Orthopedics and Fracture Repair. St. Louis: Saunders; 2006. pg. 2006-562. 5 DeAngelis M. Patellar luxation in dogs. Vet Clin North Am Small Anim Pract 1971; 1: 403-415. 6 Hayes AG, Boudrieau RJ, Hungerford LL. Frequency and distribution of medial and lateral patellar luxation in dogs: 124 cases (1982-1992). J Am Vet Med Assoc 1994; 205: 716-720. 7 Hulse DA. Medial patellar luxation in the dog. In: Bojrab MJ. editor. Disease Mechanisms in Small Animal Surgery. Philadelphia: Lea&Febiger; 1993. pg. 1993-808. 8 Roush JK. Canine patellar luxation. Vet Clin North Am Small Anim Pract 1993; 23: 855-868. 9 Slocum B, Slocum TD. Trochlear wedge recession for medial patellar luxation. An update. Vet Clin North Am Small Anim Pract 1993; 23: 869-875. 10 Arthurs GI, Langley-Hobbs SJ. Patellar luxation as a complication of surgical intervention for the management of cranial cruciate ligament rupture in dogs. A retrospective study of 32 cases. Vet Comp Orthop Traumatol 2007; 20: 204-210. 11 Roch SP, Gemmill TJ. Treatment of medial patellar luxation by femoral closing wedge ostectomy using a distal femoral plate in four dogs. J Small Anim Pract 2008; 49: 152-158. 12 Hazewinkel HA, van den, Brom WE, Theyse LF. et al. Comparison of the effects of firocoxib, carprofen and vedaprofen in a sodium urate crystal induced synovitis model of arthritis in dogs. Res Vet Sci 2008; 84: 74-79. 13 Flo GF, Brinker WO. Fascia lata overlap procedure for surgical correction of recurrent medial luxation of the patella in the dog. J Am Vet Med Assoc 1970; 156: 595-599. 14 Hulse DA. The stifle joint. In: Olmstead ML. editor. Small Animal Orthopedics. London: Elsevier Health Science; 1995. pg. 1995-395. 15 Wangdee C, Kalpravidh M. Tube realignment for patellar luxation repair in dogs. Thai J Vet Med 2008; 38: 39-44. 16 Talcott KW, Goring RL, De Haan JJ. Rectangular recession trochleoplasty for treatment of patellar luxation in dogs and cats. Vet Comp Orthop Traumatol 2000; 13: 39-43. 17 LaFond E, Breur GJ, Austin CC. Breed susceptibility for developmental orthopedic diseases in dogs. J Am Anim Hosp Assoc 2002; 38: 467-477. 18 Roy RG, Wallace LJ, Johnston GR. et al. A retrospective evaluation of stifle osteoarthritis in dogs with bilateral medial patellar luxation and unilateral surgical repair. Vet Surg 1992; 21: 475-479. 19 Alam MR, Lee JI, Kang HS. et al. Frequency and distribution of patellar luxation in dogs. 134 cases (2000 to 2005). Vet Comp Orthop Traumatol 2007; 20: 59-64. 20 Daems R, Janssens LA, Beosier YM. Grossly apparent cartilage erosion of the patellar articular surface in dogs with congenital medial patellar luxation. Vet Comp Orthop Traumatol 2009; 22: 222-224. 21 Linney WR, Hammer DL, Shott S. Surgical treatment of medial patellar luxation without femoral trochlear groove deepening procedures in dogs: 91 cases (1998-2009). J Am Vet Med Assoc 2011; 238: 1168-1172. 22 Arthurs GI, Langley-Hobbs SJ. Complications associated with corrective surgery for patellar luxation in 109 dogs. Vet Surg 2006; 35: 559-566. 23 Soparat C, Wangdee C, Chuthatep S. et al. Radiographic measurement for femoral varus in Pomeranian dogs with and without medial patellar luxation. Vet Comp Orthop Traumatol 2012; 25: 197-201. 24 L'Eplattenier HF, Montavon P. Patellar luxation in dogs and cats: management and prevention. Comp Cont Edu Pract Vet 2002; 24: 292-300.